For over a century, members of the family of Salomon & Karoline Friedmann Müller played an important role in the lives of the Marisfeld and Themar Jewish communities. 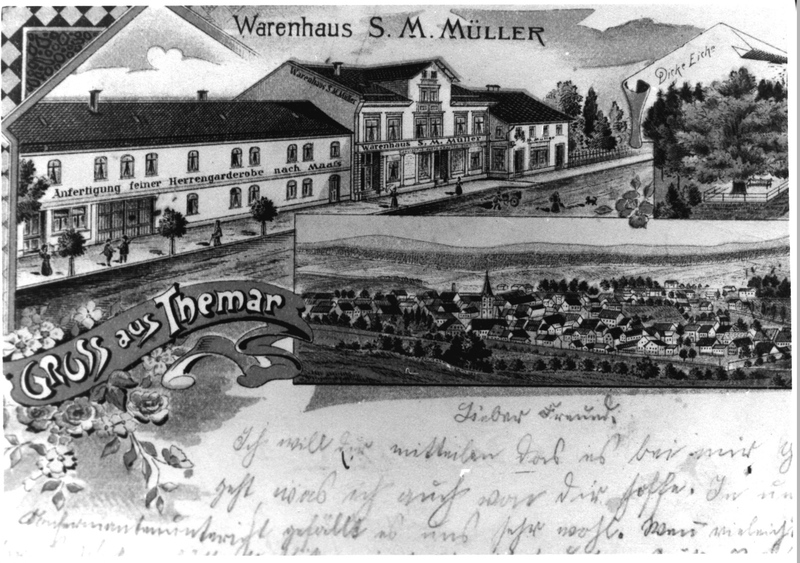 They became part of the Marisfeld community in the late 1820s; in the late 1860s, Müllers were among the first to come to Themar. Then they were among the last to leave both Marisfeld and Themar, close to eight (8) decades later. Salomon Müller was born 12 January 1802 in Bauerbach, Thüringen, about 20 kilometres west of Marisfeld. In the late 1820s, his father, Meyer, was posted to Marisfeld as Lehrer/religious teacher. Salomon was in twenties at that time and it is probably during this period that he met Karoline Friedmann who was born in Marisfeld. When Salomon and Karoline married is unknown. They had four children: Dina, Mayer and Nathan, and Simon. Of the four, we know only the birthdates and stories of two sons, both born in Marisfeld: Mayer, b. in 1849 and Nathan born 1851. Salomon, Karoline, Mayer and Nathan all played critical roles in the lives of both the Marisfeld and Themar Jewish communities. Available records make visible the following contours: it seems clear that Salomon Müller, age 64, was among those who left Marisfeld in the years after 1866, after fire had reduced much of Marisfeld to ashes. Whether either Mayer and Nathan accompanied him at this time, we do not know. Mayer was 17 in 1866, Nathan 15; both would have finished school and may have been in apprenticeship elsewhere in Thüringen or Germany. We know that Mayer lived most of his adult life in Themar, from at least 1873 when his first child was born, until 1907. Nathan spent his adult years — 1876, or earlier, until his death in 1923 — in Marisfeld. Map of Themar, 1903 shows the undeveloped meadow running to the south of Bahnhofstrasse and the Marketplace at the time the Müllers started their business. 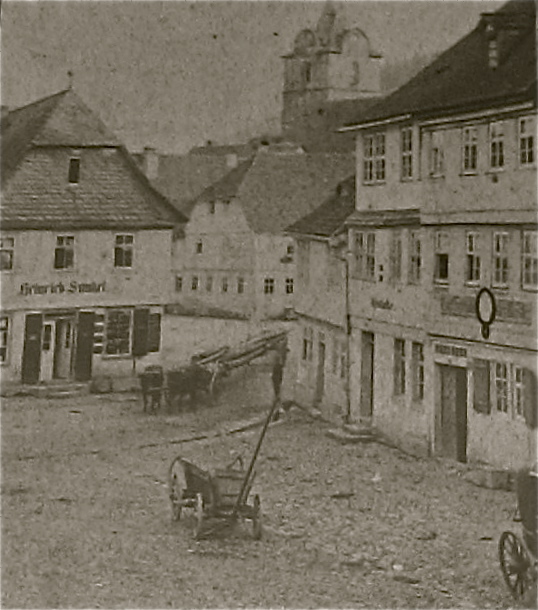 This early photo, taken of the Marktplatz not far from the S.M. Warenhaus gives some sense of the state of the roads at the time the Müllers opened for business. Source: City of Themar. But Salomon correctly saw that the city would grow: in 1872, the “S.M. Müller Warenhaus” opened; the initials, “S.M.,” we believe, stand for the names Salomon Meyer, Meyer being the name of Salomon’s father and probably part of Salomon’s name. The business flourished in Themar growing along with the small city’s population, which reached close to 1800 by the time of Salomon’s death in 1890. The entire community shopped at the store. The family also quickly established itself within the Jewish community of Themar, which numbered 118 by 1888. Salomon was the deputy leader of the Jewish community whom Rudolf Lommer remembered well in his memoir 50 years later. 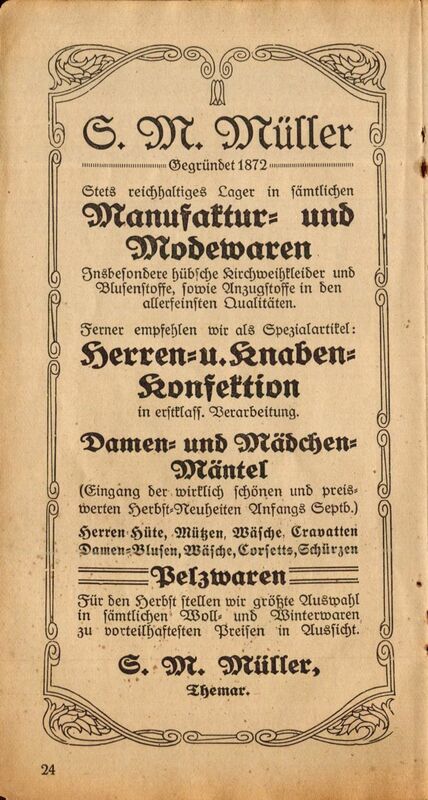 An ad in a 1921 Fall Fair Catalogue proudly states the long life of S. M. Müller in Themar. Source: Stubenrauch Collection. S.M. Müller Warenhaus in the Bahnhofstrasse, Themar, c. 1898. Source: Themar City Archives. Salomon Müller died in 1890, age 88, after living two decades in Themar; he was buried in the Marisfeld Jewish cemetery. 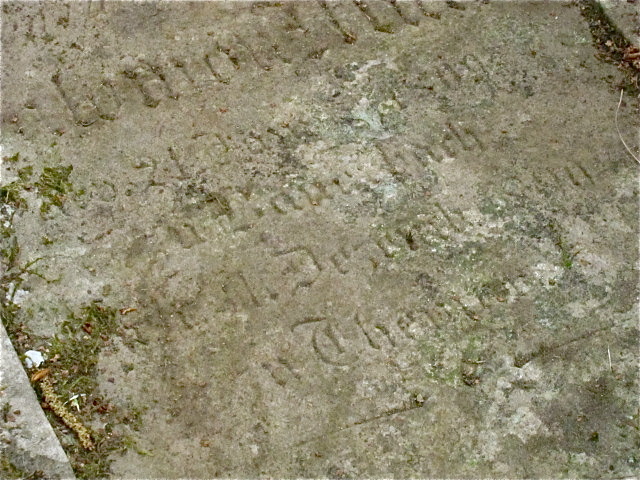 His wife, Karoline, is buried next to him but time has erased the inscription on the stone. At the time of Salomon’s and Karoline’s deaths, the next generation of Müllers was making its mark on Marisfeld and Themar. Mayer Müller lived in Themar with his wife, Babette (née Friedmann), sister of Marianne Sachs (née Friedmann). Between 1873 and 1886, seven children were born to them, although only six of them lived beyond infancy. Likewise, between 1878 and 1892, Nathan and Berta (née Schwed) Müller were raising six children in Marisfeld. The lives of this generation wove through the history of Marisfeld and Themar for another five decades, until 1942. 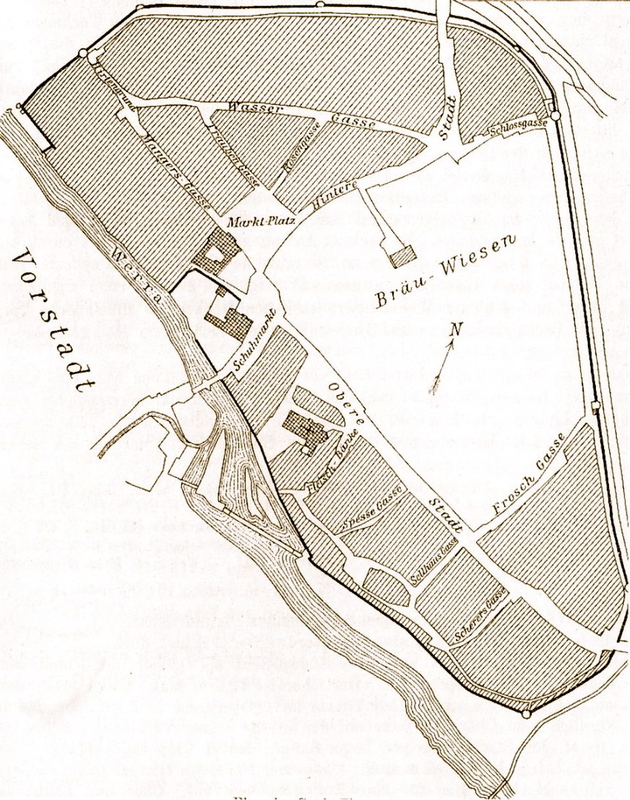 After that, no member of the Solomon and Karoline Müller family lived in either community. Significant numbers of them, however, flourished in other parts of the world. For the full Descendants List of the Müllers and their families born in Germany up until 1945, please see here. Gravestone of Solomon Müller, b. Bauerbach, d. Themar. Jüdischer Friedhof Marisfeld, 2011. Source: Meen 2011. The Descendants List of the members of the S&K Müller family who were born in Europe before 1945. 1. Family collections of Müllers throughout the world. 2. Ancestry.com [database on-line]. Provo, UT, USA: The Generations Network, Inc.
3. Jüdischer Friedhof Marisfeld, Inventory, 2000. 4. Das Bundesarchiv. Gedenkbuch: Opfer der Verfolgung der Juden unter der nationalsozialistischen Gewaltherrschaft in Berlin. Last update December 2010. 5. Human, Rudolf Armin. Geschichte der Juden im Herzogtum Sachsen-Meiningen-Hildburghausen. Hildburghausen: Kesselring, 1898/reprinted Weimar: F. Fink, 1939. 8. Wolf, Siegfried. Juden in Thüringen 1933-1945: Biographische Daten, ed. S Wolf, 2 volumes.